Our fellowship is greatly blessed to have such a focus on ministry directed towards men. Of course, we have all kinds of ministry for women, married couples, singles and teens, but if you look around much of the Christian world you'll notice that there is a disproportionate amount of ministry directed at women. Women's retreats, women's conferences, women's cruises, on and on it goes. So the ladies get to have all kinds of ministry while the fellas get to... stay home and watch football? Make repeat-trips to the fridge? That's one of the reasons we do things like men's discipleship classes and men's rallies. 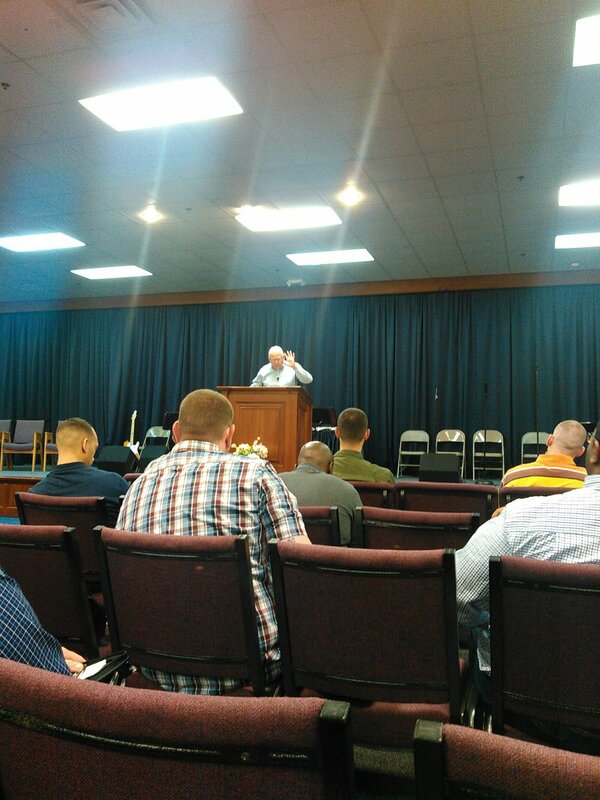 Speaking of which, this past weekend there was an incredible men's rally in Jacksonville, NC. The two-day event which featured three well-seasoned speakers, focused on such themes as foresight and obedience. On the subject of foresight, Pastor Paul Stevens ministered that the use of foresight is what will help us to avoid some of our bad decisions. He emphasized some because it is impossible that we can avoid every bad decision, since we generally only figure out that it was a bad decision when it's hindsight. Additionally, we cannot allow our own agenda to blind us, we must stop, think and pray before moving forward. Those were just a few of the tidbits, or "crumbs falling from the masters' table." But Pastors Stevens, Szespanski and Lobato each spoke about something that I dare say every man struggles with: failures. That is not an exaggeration. I'll go even a step further - if you ever meet a man who claims that he doesn't struggle with failure, check him for a pulse; you might be talking to a robot. As men, we don't learn from our successes, we learn from our failures. Yet, because we have such fragile egos we often let our failures define us even when we eventually achieve success. Where it gets tricky is when we learn nothing from the failure and either repeat it, or we completely stop all forward progress. I need not remind you of the definition of insanity, but I will say that a failure is only a true failure if you learned nothing from it. To gain some valuable perspective, perhaps one the best quotes on the matter is from the inventor of the light bulb, Thomas Edison: "Results! Why, man, I have gotten a lot of results. I know several thousand things that won't work." For a little further reading and encouragement, take a peek at this article regarding 50 successful people who failed at first. In case you are not subscribed to Pastor Adam's blog, he has some tremendous take-aways from the rally as well. You can read about that here, as well as some other very encouraging events that have taken place recently. Please join us for our Wednesday "Recharge" Services. Pastor Adam continues the series "Pray, Think, Vote." Services begin at 7:30pm. What an encouraging and an informative series it has been. Don't miss it! We welcome Evangelist Richard Brooks back to Virginia Beach. Gloriously saved and filled with the Holy Spirit while in an Australian prison, Richard eventually became a missionary in Romania. it is always an incredible time when he comes. We are up to Episode 27 already! Are you subscribed? Click here to check out our latest episodes. As a side note, the Trunk or Treat scheduled for Saturday the 29th has been cancelled. Until next time, Godspeed to you and yours!